Here I am going to share my experience of clearing KVPY SA in 2014. This part focuses on providing tips and tricks to students for KVPY SA written examination. As we are entering into a new academic session, we all are feeling the heat of competitive exams coming near. One of them is the KVPY Exam (Kishore Vaigyanik Protsahan Yojana) to be held in November, 2019. The badge of being a KVPY Scholar is a prestigious one and it provides direct admission to top institutes like IISc and the various IISERs. KVPY exam is at par with the IIT Entrance when it comes to the difficulty level. But there is no need to press the panic button now. 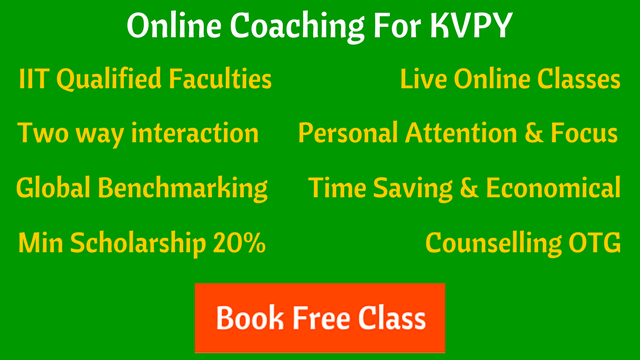 You can clear the KVPY exam successfully if you prepare smartly. Being a KVPY SA Stream Scholar myself, I have the first-hand experience of overcoming the challenges of the KVPY Written Exam (online mode) and the subsequent Interview round. I am here to provide you with the tips and tricks for clearing the KVPY SA 2019 Exam (Round I) and at the same time will give you suggestions that helped me personally in my preparation. Before I go into the subject-wise analysis, it’s advisable that you should make yourself more or less equally adept at all the four subjects (Physics, Chemistry, Mathematics, Biology). You have to keep in mind that all the four subjects are equally important and if you neglect anyone of them, you can kiss a goodbye to your hopes of cracking the KVPY SA exam. PHYSICS : Make sure that you are thorough with the class XI syllabus. The most important topics are Mechanics, Ray Optics, Electromagnetism. You should know the class XI level Mechanics properly. I assume that Ray Optics and Electromagnetism is not there in your class XI syllabus. But there is no need to worry. The basic class X level knowledge in these two topics is enough. The less important topics, that is – Thermodynamics, SHM, and Waves should preferably be completed from the class XI book. MATHEMATICS : You will need to know almost all topics from class XI. Class X level knowledge of Geometry is required. If you know the basics of Number Theory, it will help you a lot. Mental ability based questions which involve Algebra, Geometry are important. Important chapters include Quadratic Equation, Progression and Series, Permutations and Combination, Basic Geometry. In Coordinate Geometry, Conics is NOT required. Get ready to wrack your brain as you are going to face a lots of IQ-Based problems. CHEMISTRY : In brief, you need the knowledge of Physical Chemistry of Class XI level. The key chapters are Atomic Structure, Chemical Bonding, Chemical Energetics, Stoichiometry and Gaseous State. Class X level knowledge of Organic Chemistry is enough for you. Don’t worry about Inorganic Chemistry. Hardly any question comes from there. Even if you encounter an odd question from there, you will be able to solve it with a basic Class X knowledge. BIOLOGY : I am not a Biology student. I didn’t have Biology as my subject in Class XI. If you don’t have it too, don’t worry, just be cool. A basic Class X knowledge of Biology is enough. Infact if you know the Class X syllabus pretty well, you can even score cent- percent marks in Biology. Just open your class X book and revise. Solve the previous years question papers of KVPY rigorously. Find your loopholes, and work on them. Unlike IIT-JEE, you are NOT going to face new types of problems every year in KVPY. So, if you have thoroughly practiced previous years questions, then it helps immensely. Finally, it is just a test of your Analytical Skills and your Aptitude in Science. Be calm and confident while appearing for the exam and don’t be stressed unnecessarily. I hope these examination tips will help you in clearing KVPY SA 2019 exam and becoming a proud KVPY scholar. Indranil Majumdar is a KVPY SA Scholar 2014. He loves Physics and has a keen interest in Astronomy and Astrophysics.